If you are interested in a puppy or adult German Shepherd dog please do not hesitate to contact us. Our phone lines are always open, but if you'd like to drop by, please make an appointment by calling us or completing the contact form below. We would love to hear about your inspirations in training your dog and see if we can help you with that. Training should be fun for both you and your dog. We are located in Niagara Region of Ontario. NOTE-DO NOT USE GPS to get to our location, none of them work for our address.. Follow the info below. TURN LEFT (south) at the lights onto Victoria Ave. (RR 24). You are about 15-20 min away!! Go through 4-5 sets of lights. Keep going through a 4-way stop sign at Canboro Rd. Keep going through a yellow flashing light at the golf couse. This will take you to a 2nd 4-way stop sign. This is OUR ROAD – RR 27. There is a little log cabin restaurant on the corner called the 2x4 Diner. TURN RIGHT (west). We are 1 km down on the left (south) side. If the gates are shut, we will be at the training building by the road on the far side of the house (brown portable school building). Take Lundy's Lane out of Niagara Falls going away from the U.S. Rainbow Bridge. Lundy's Lane will turn into Hwy 20. Continue (20-25 minutes) until you reach RR 24 (Victoria Ave.). TURN LEFT (south) onto RR24 (Victoria Ave.). Go through a 4-way wtop wign at Canboro Rd. Go through a yellow flashing light. TURN RIGHT (west) We are 1 km down on the left (south) side. Once you go through Canada Customs, you will automatically be on the QEW Highway. At the 4th or 5th exit you will see the exit for NETHERBY ROAD. Take this exit. Go down the ramp and at the STOP SIGN TURN LEFT (west) onto Netherby Road. You will be on this road for a good 20 minutes. You will go through two 4-way Stop signs, then through a tunnel and then through a set of traffic Lights. You will TURN RIGHT (north). At the 1st set of lights now will be BROADWAY AVE.
You will TURN LEFT (west). Go to the end and there you will be at River Road - RR27. TURN LEFT again and follow the river all the way down. You will come to a 4-way STOP SIGN. GO STRAIGHT THROUGH. We are right on RR 27, about 1 km on the left (south) side. 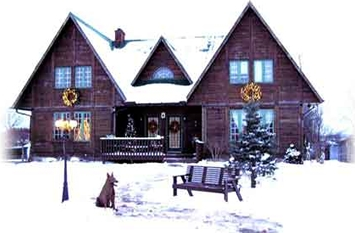 Our house is a log home with a brown roof and a large pond in the front yard. The training field is on the far side of the house, it has a portable school building out by the road that we train in.